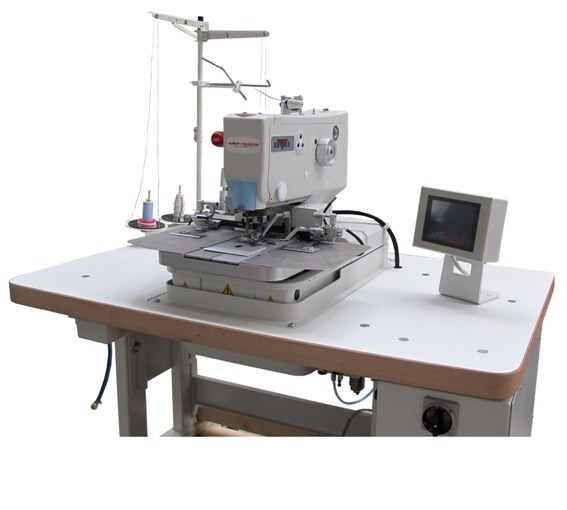 The ES 505 Indexer machine is specially designed for sewing multiple buttonholes on jacket sleeves and jeans fly fronts at required distances between each buttonhole.The indexer unit ensures that buttonholes are sewn automatically one after another at required lengths and distances that are set by the operator on the touch screen display. The new angle model allows sewing of slanted buttonholes with angle up to 45 degrees.Structural design of the indexer unit, placed behind the clamp feet, ensures easy access to the looper area if needed. The indexer unit does not need to be disassembled when taking off the clamp plates for easy maintenance. Unbeatable sewing speed adjustable from 1,500 spm to 2,700 spm directly from the touch screen display. Different sewing speed can be programmed at the start/stop position, around the eye and in the cross bar finish to ensure excellent sewing quality even on difficult materials. The new concept of the sewing head provides the operator with larger handling space in the sewing area. The new, stronger main drive increases machine performance and is integrated in the sewing head. Developed to increase the machine performance, lifetime and decrease the machine sewing head vibration. Incorporated LED sewing lights around the cutting block eliminates darker spots in the sewing area and provides optimum light conditions while working on the machine. The vertical cutting improves the buttonhole cutting in its whole length. Clean and reliable buttonhole cutting is provided on all types of material. The machine is equipped with new longer clamp feet. The longer arms improve the material handling and provide the operator with more space when clamping the sewn garment. The sewing head opening is very easy with the support of gas spring. The head can be opened in several heights depending on the operator's needs. Larger machine base also provides better access to adjusting mechanisms. The optimization of the main stitch cam eliminates the machine vibration and reduces the noise level. New design ensures quick and sufficient oil distribution to the critical parts of the machine and reduces maintenance time. There are two central oil indicators on the machine. The waste material removal & suction system helps to keep the working environment cleaner. This pneumatically controlled system prolongs the knife lifetime and provides improved buttonhole cutting. Recommended for sewing of regular eyelet buttonholes with single thread on jacket sleeves. This model can sew straight or slanted buttonholes. 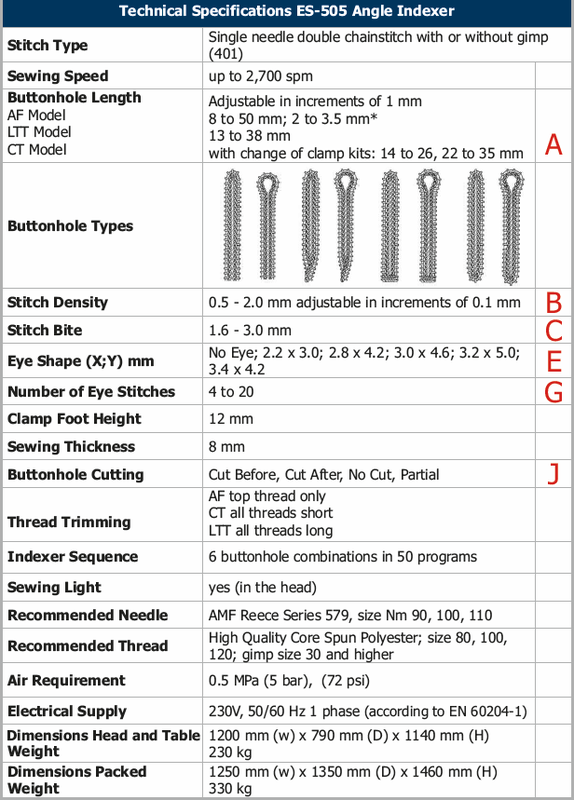 AF model is recommended for all buttonhole applications that require only top thread trimming. The size range of buttonholes is adjustable from 10 to 50 mm. Both models are used for applications with double thread, including or excluding gimp. CT model is mainly intended for use on jeans, trousers or other applications where all threads need to be trimmed from the very end of the buttonhole. Buttonhole sizes ranging from 14 to 35 mm can be sewn by using the two different clamp set. Suitable for sewing of slanted buttonholes with double thread, with or without gimp, especially on jacket sleeves. LTT model is mostly used on tailored clothing, when the end of the buttonhole is left open and the long tails of the threads are pulled through the buttonhole to be tacked in a separate operation. Buttonhole length can be set from 13 to 38 mm. All threads are trimmed with a 20-30 mm tail depending on the buttonhole size. the start of sewing, to ensure that the first stitch is formed properly mainly on difficult fabrics and/or tough sewing conditions, especially associated with the crossbar buttonhole.